What if the Great Wall Of China were actually built as a defense against a colony of spike-toothed, green-blooded sauroid aliens that crashed into Inner Mongolia on a meteorite sometime around the eighth century B.C.? Such is the premise of Zhang Yimou’s stupidly awesome The Great Wall, a 3-D nationalist fantasy that follows two smelly medieval Europeans as they trek East with the plan of stealing the secret of gunpowder, only to find themselves at the final stages of China’s 2,000-year war against man-eating extraterrestrials—a historical episode that has, for whatever reason, never been previously depicted on screen. Zhang, who is best known in this country for the eye-catching martial arts films Hero and House Of Flying Daggers, couldn’t care less about these burbling monsters, and his human characters come a distant second at best. His interests lie in the Olympic pageantry of spears, signal flags, and color-coded military regiments, and the cogwheels and lantern gears that drive wondrous war machines—like something Leonardo Da Vinci might have doodled in a paper margin and scratched out as impractical. Think of the result as The 13th Warrior as remade by Leni Riefenstahl. 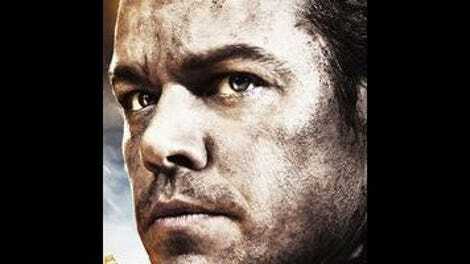 An often baffling Matt Damon leads the cast as William, a former soldier of fortune who is captured alongside his Spanish compadre Tovar (Pedro Pascal) by the trained-from-birth superwarriors who man the Great Wall. Dubbed the “Nameless Order,” they have defended China for centuries from the taotie, who swarm once every 60 years out of a nuclear-green crater in the side of a mountain. The narrative doesn’t stand up to scrutiny, and has at least two plot holes that are also literal holes. The only logic it follows is that of propaganda and spectacle—of impressive mass formations and troop movements and the sight of the Great Wall snaking toward the horizon over a rugged landscape. In the film’s ludicrous, bird’s eye scale, everything happens in hundreds, as stampedes of alien monsters are driven back by volleys of harpoons, arrows, and fireballs and by armored soldiers who rappel down the side of the wall to face their clawed foes upright on a steep incline. They fight the taotie with hot-air balloons, giant mechanical shears concealed behind the bricks of the Great Wall, and a special unit of bungee-jumping warrior women, commanded by the heroic Lin Mae (Jing Tian). William, though handy with a bow, is mostly there to marvel at technology and industry and to learn the Nameless Order’s virtues of selflessness, trust, and hygiene, all in keeping with China’s burgeoning pop mythology of East-West interchange, evident in recent historical fantasies from Dragon Blade to Detective Dee And The Mystery Of The Phantom Flame. Damon plays the character with at least five different intensities of Irish accent, and they cycle randomly from scene to scene, as though on demo mode. 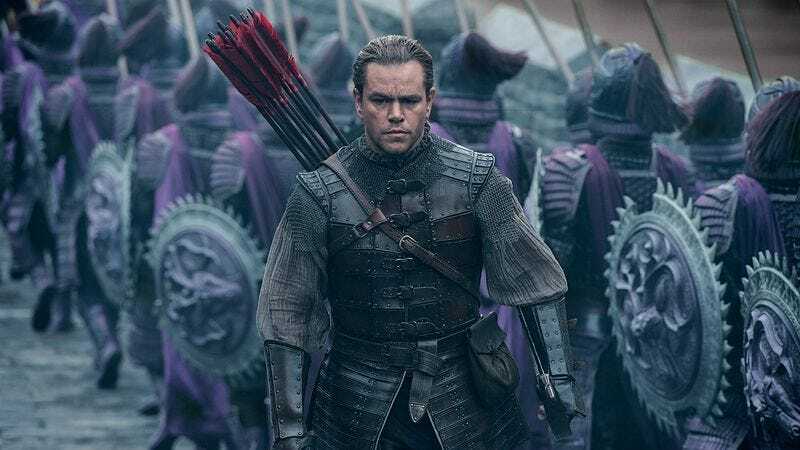 But if The Great Wall is too spotty to really satisfy as the old-fashioned medieval adventure it sometimes aspires to be, it is consistently engaging as an almost abstract exercise in visual sumptuousness. Zhang spends almost as much time on the Nameless Order’s elaborate preparations for battle as he does on the battles themselves, and stages them with his usual flair for synchronized movements and patterns. There is no logical reason for the film to climax in a tower of stained glass that paints Lin Mae and William in psychedelic Suspiria lighting, but boy does it look gorgeous in 3-D.